•NEW Formulae and NEW Hi-Fibre race variety! The <Lo-Fat>™ tyre sealant, it is super-light, with a dose of 30-120ml per tyre in most road to mountain to downhill bikes, depending on size. NEW Magic Milk™ Hi-Fibre race sealant is a premium product, designed to deal with both the high pressures of road race bikes (tubeless, tubed or tubular): and also the low pressures of downhill/enduro/gravel racing. Habitat Mountainbike Team are winning races using Magic Milk™ and find it “perfect” – Maarten Kemperman, Team Manager. See the video showing their technician applying the product at a race meeting. David Rosa, 8-time Portugese MTB Champion, who has made his own Magic Milk video with a dramatic tyre spiking followed by a forest run! 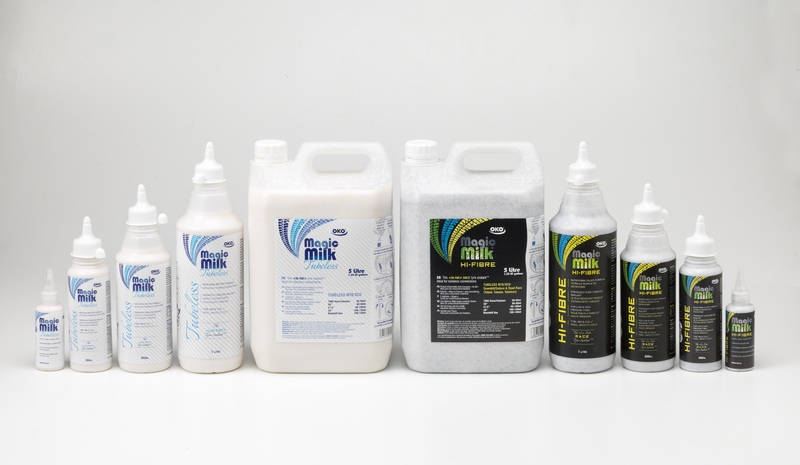 NS Bikes Factory Racing Team, a leading force in Downhill, has also switched from the traditional tubeless brand to Magic Milk Hi-Fibre (“your Milk is awesome!” – Dominic Tinner, Team Manager). CX SMP Team, UCI Cyclocross and Marathon MTB, have converted to us as well : see their 2018/19 Winter calendar as they race around Europe. GHOST Factory Racing, a works team of all-female National Champions from around Europe in UCI MTB/XC, is a new addition from 2019, using Magic Milk Hi-Fibre in their Maxxis tyres. Simple bottle/valve stem fitting, using the new resealable tapered cap: screw it over a removable-core Presta valve stem or fit inside a Schrader stem. Or squeeze into the partially-mounted tyre. • Longer effective life than competitors – usually 6+ months before you top up in mild climates: will not ball up inside the tyre, dries as an even layer. Can be topped up so you don’t need to strip off the tyre. Non Corrosive: Non Flammable: Non Hazardous (not excluded from air shipments unlike some ammonia-containing products). Washes out of the tyre if required. NO ADVERSE AFFECT UPON TYRES OR RIMS (contains anti-corrosion agents). WORKS WITH TUBELESS READY and FULL UST TUBELESS WHEELS/TYRES, with Schrader or removable-type Presta valves. (if you have non-removable Presta valve cores, pour Magic Milk™ into tyre well then mount tyre onto rim). For ‘tubeless ready’ tyres on standard rims, always use a rim strip plus OKO Magic Milk™. Shake the tyre/wheel combination vigorously from side to side at each point to force the sealant into the little gaps between bead and rim, and into the tiny holes in the porous tubeless ready tyre sidewalls. Also spin the tyre on the wheel for a prolonged period. Follow tyre and wheel manufacturer instructions. Colour: White. Free-flowing. Low Odour (no nasty ammonia smell). For maximum accuracy, for easier use with removable-core Presta valves, and for a host of workshop uses, use one of the OKO Tyre Sealant Injectors. No risk and safety labels or warnings are required since this product is not classified as hazardous under current regulations. Normal safety precautions should be taken: wear gloves and protect eyes. Rinse product off any clothes that it may be spilled upon. Keep away from children. If swallowed, see a doctor.